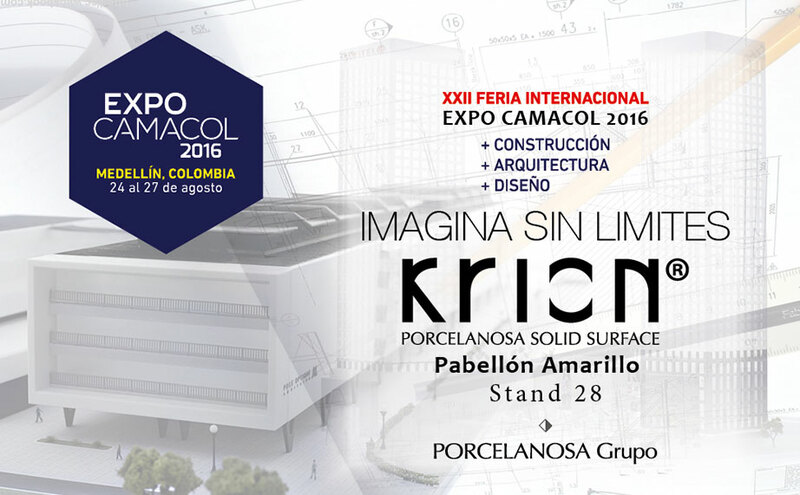 PORCELANOSA Group, along with KRION®, will be present for the first time at one of the most important Architecture, Construction and Design trade fairs in Latin America, EXPO CAMACOL 2016. In the 2014 edition, over 54,000 people visited the 440 exhibitors at the 24,000m2 international trade fair which encompassed sectors where the solid surface from PORCELANOSA Group, KRION®, takes on great importance. Homes, transport, design, public spaces, restaurants, commercial premises, businesses, hotels, and healthcare are some of the sectors in which KRION® stands out. Within these, we can apply the material in products, interior coverings, exterior coverings, furniture, units, commercial units, countertops, bathroom fittings and signage, making the 22nd EXPO CAMACOL International Trade Fair a perfect event for our compact mineral. We invite you to visit us at Stand 28 of the Pabellón Amarillo building, Plaza Mayor, Calle 41 No. 55-35, Medellín, Colombia. KRION® PORCELANOSA Solid Surface; we’re waiting to amaze you.